Oh, my gosh, this is the BEST Shepherd’s Pie EVER!!!! No kidding. You won’t believe how wonderful this main dish is, or how succulent and delectable every bite is. I could have eaten the whole casserole by myself. Really. It’s that good. 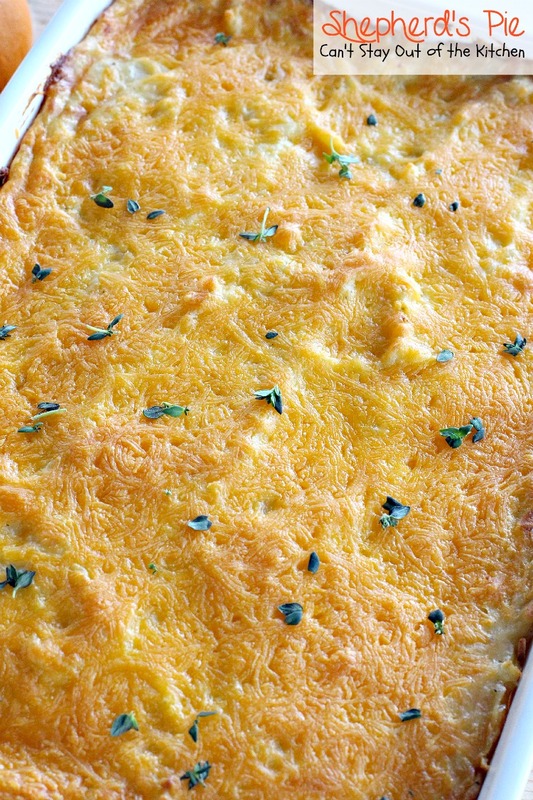 I can tell you this scrumptious dish is going to be my go-to Shepherd’s Pie recipe from now on. There isn’t anything I don’t like about this savory meat pie. 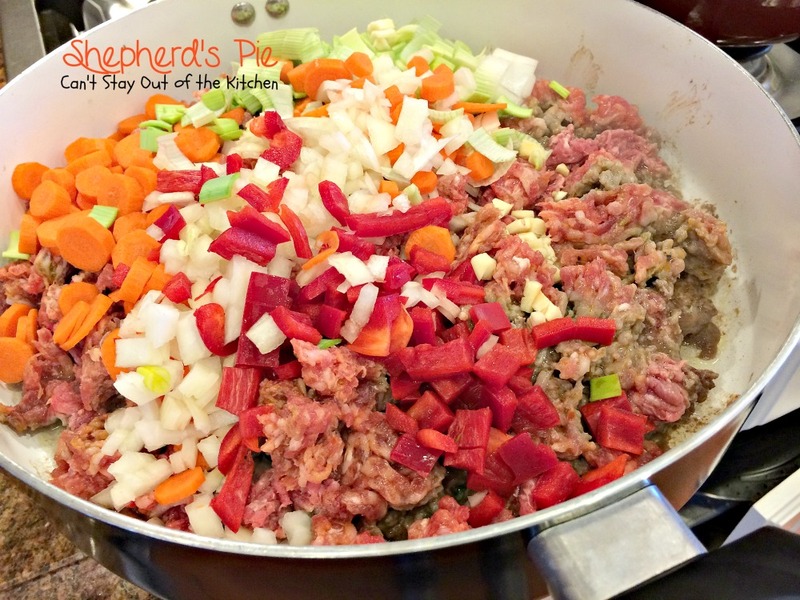 Shepherd’s Pie uses both lean ground beef and Italian sausage (although you can use lamb, turkey or venison if you desire). Then it’s filled with all kinds of veggies: peas, carrots, corn, leeks, garlic, onions and bell peppers. The seasoning is what makes this recipe so special. It includes tomato paste, Worcestershire sauce, oregano, thyme and rosemary and the combination is so tasty. The mashed potato topping is absolutely sensational. It has parmesan and cheddar cheeses and it’s so thick and creamy because of the butter and heavy whipping cream. Using a whole egg yolk is also genius. All in all this is one of the BEST casseroles I’ve ever eaten. High praise, I know. 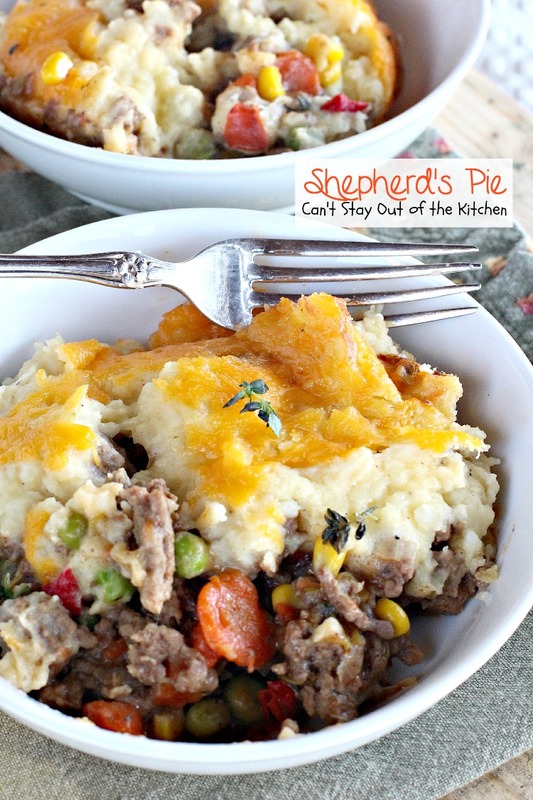 I LOVE Shepherd’s Pie even though it was not a traditional dish my mom ever made. It wasn’t until after I moved away from home that I first started eating this delightful one-dish meal. 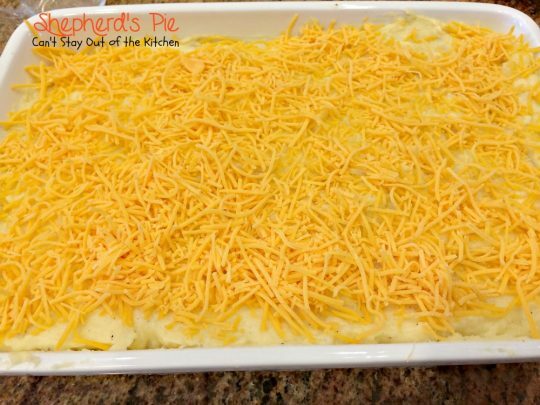 The first time I remember eating Shepherd’s Pie was when I worked at Walt Disney World back in the 1970s. I sampled this from the company cafeteria and loved it instantly. 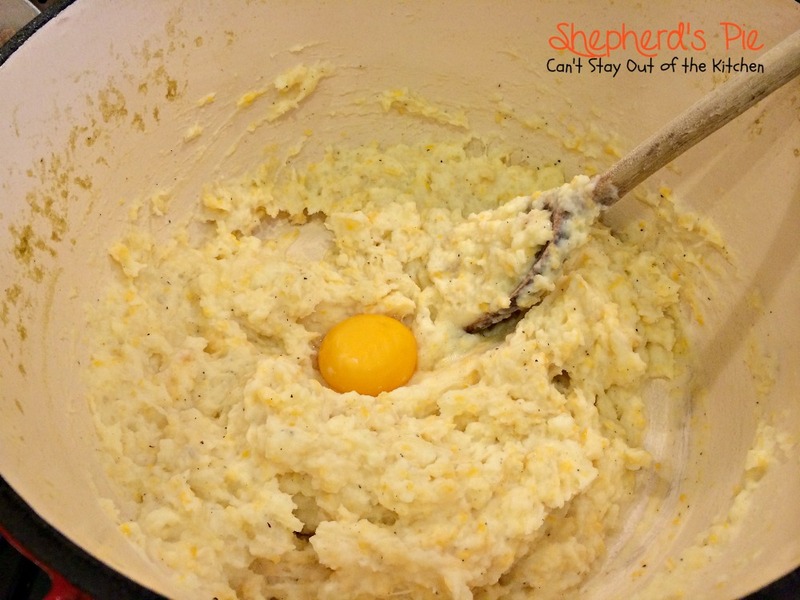 I’ve scoured recipes over the years and I’ve probably tried at least ten or fifteen different ones over the decades, but no other Shepherd’s Pie recipe has compared to this one. Sensational is an understatement. I’ve made a few changes from the original recipe. I doubled the mashed potato topping because the original amount didn’t quite cover the top of the casserole completely. I added leeks which always provide more savory flavor, and used some fresh herbs rather than dried. I also used gluten free flour instead of regular so the casserole would be gluten free and not spike my blood sugar the way regular flour does. 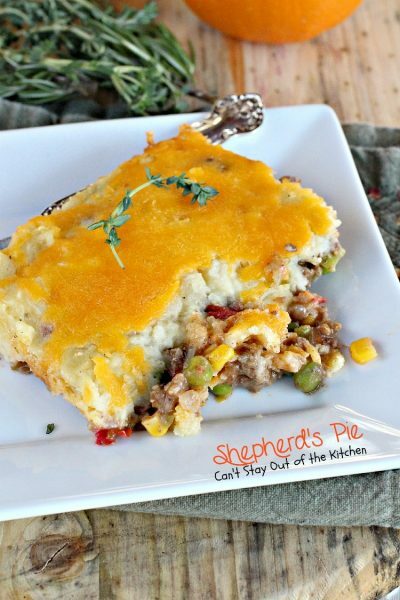 Shepherd’s Pie is one of the BEST meat pie’s you’ll ever eat! 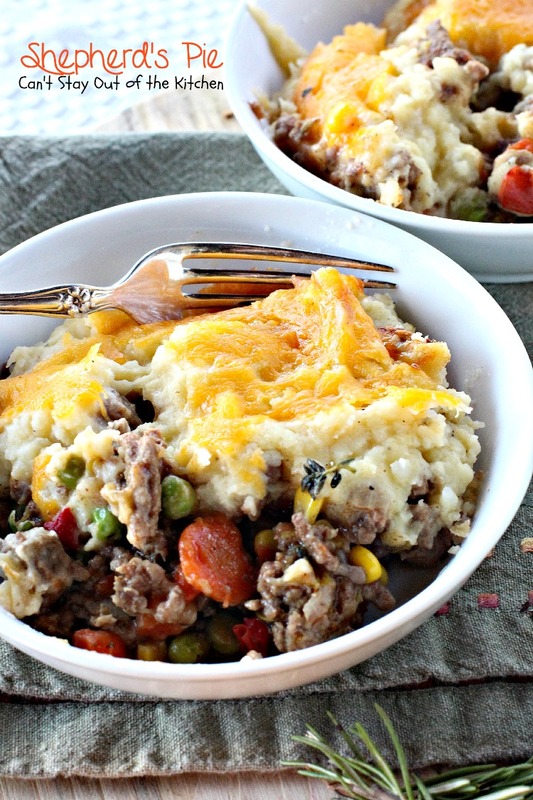 Shepherd’s Pie is great for family dinners or company. You and your family will be salivating big time over this amazing recipe! Every bite of this Shepherd’s Pie will have you drooling. I used these ingredients for the meat layer. You can make this Shepherd’s Pie with or without gluten free flour, as you wish. Crumble beef and Italian sausage in a skillet over medium heat. Add onions, leeks, carrots, garlic and bell peppers. Cook meat until it’s no longer red. Break up the beef with a fork while cooking. Drain off grease. Sprinkle flour over top of meat mixture and stir to combine. Continue sauteing about 1-2 minutes. Add salt, pepper, thyme, rosemary, oregano, tomato paste, Worcestershire sauce and chicken or beef broth. Stir to combine and cook 5-10 minutes. Turn off heat and add peas and corn and stir to combine. Spray a 9×13″ glass baking dish with cooking spray. 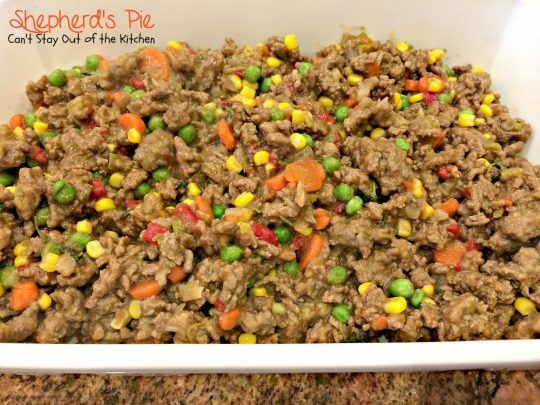 Spread meat mixture into prepared baking dish. I used these ingredients to make the mashed potato topping. Peel and cube potatoes. Boil potatoes in boiling water until softened. 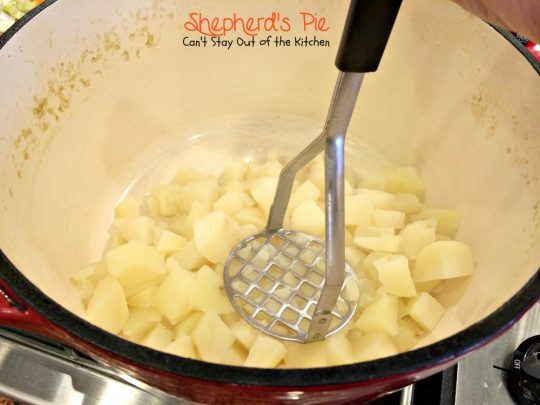 Drain and mash with a potato masher. My pictures show only a single batch of the mashed potato topping before I added another batch. 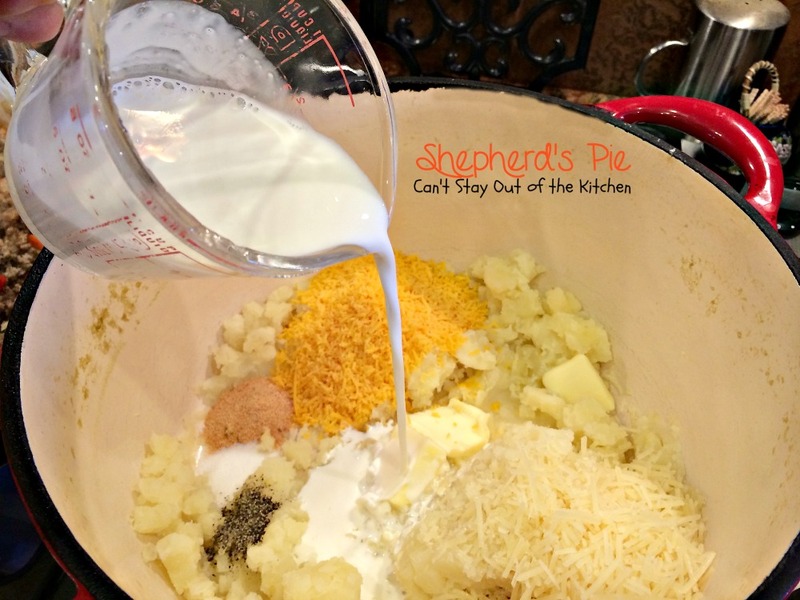 Add salt, pepper, garlic powder, butter, parmesan cheese, cheddar cheese, and heavy whipping cream. 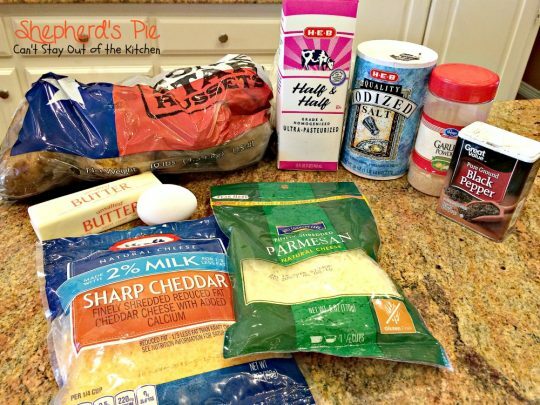 Stir ingredients to combine. Add egg yolks and stir again to combine. Spread mashed potato mixture over top of meat mixture. Use a rubber spatula and make sure potatoes cover all the way to the edge of the baking dish to seal the mixture. Sprinkle remaining cheddar cheese over top. Bake at 400 for about 30 minutes. Allow casserole to sit out about 10 minutes before serving. 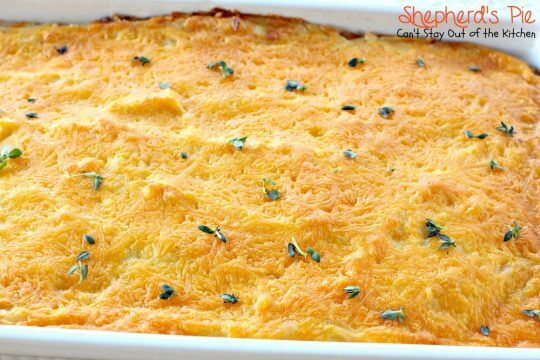 Serve Shepherd’s Pie garnished with fresh thyme, if desired. The sauce in this Shepherd’s Pie recipe is outstanding. It’s time for a serving! 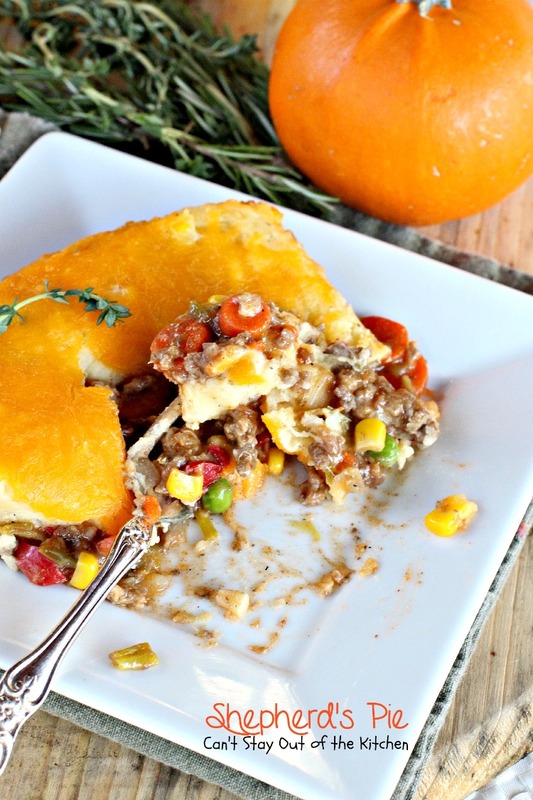 This classic meat pie is filled with two meats, lots of veggies and seasoned to perfection. It's topped with creamy, cheesy mashed potatoes. This version is gluten free. 6 large Russet potatoes, diced about 4 lbs. Add diced potatoes and boil about 15 minutes until soft. Add potatoes back into the stock pot. Add butter, half-and-half, both cheeses and seasonings. Stir together well to combine. Add egg yolks and stir again to combine. In a large 12” skillet, fry ground beef, sausage, carrots, red bell pepper, onions, leeks and garlic until veggies are tender and no pink remains on the beef. Cut beef down in small pieces while frying. Sprinkle flour over top of beef mixture and work into beef. Add salt, pepper, tomato paste, Worcestershire sauce, chicken broth and seasonings and cook about 5-10 minutes at a simmer. 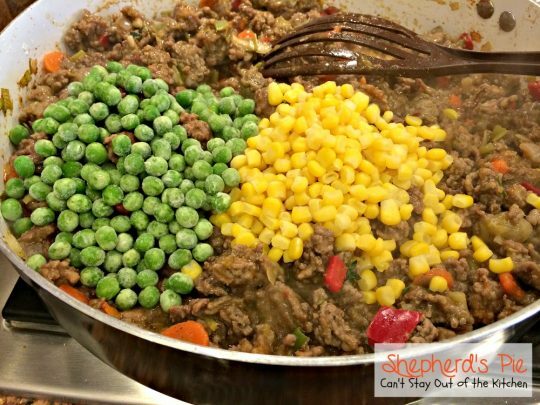 Add corn and peas and stir to combine. Pour meat mixture into prepared baking dish. 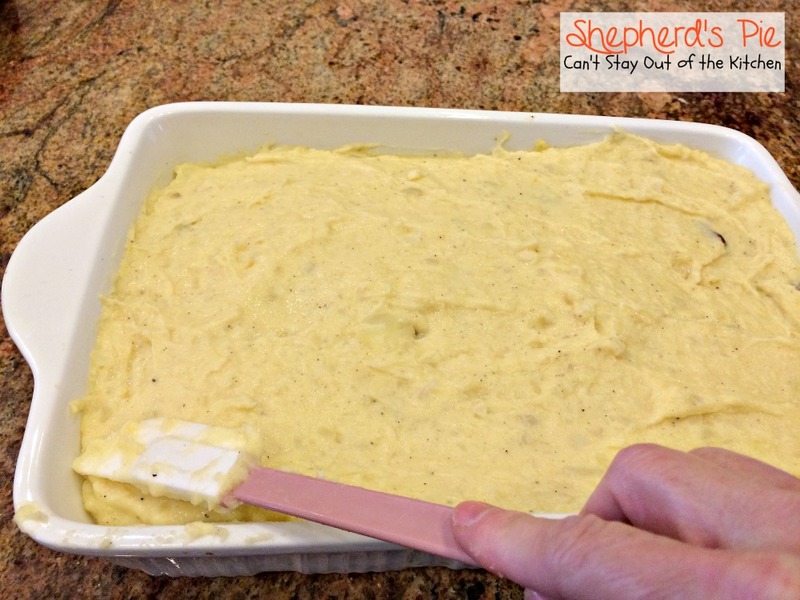 Spread mashed potato topping with a rubber spatula all the way to the edges to seal in the beef so there are no gaps. Sprinkle 1 cup of cheddar cheese over top. Bake at 400° for about 30 minutes until top is lightly, golden brown. Allow casserole to sit out about 10 minutes and set up before serving. Garnish with fresh thyme, if desired. 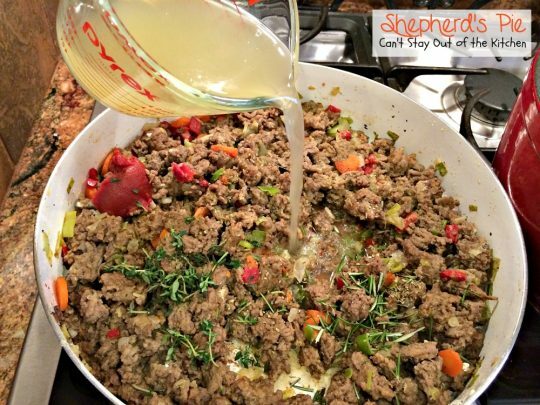 NOTE: You can also use ground turkey or ground lamb or any combination of meats (beef, sausage, pork, venison, turkey, lamb). Recipe source: adapted from Alton Brown, Food Network. 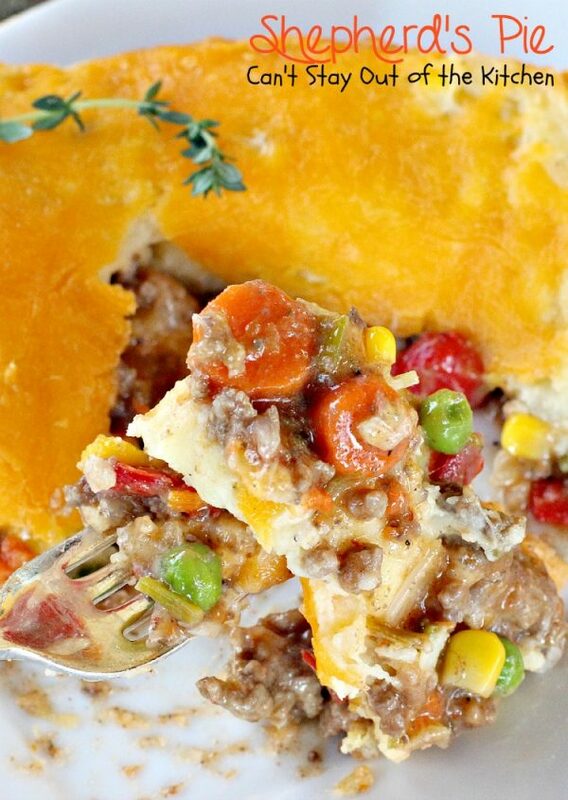 This classic meat pie is filled with two meats, lots of veggies and seasoned to perfection. 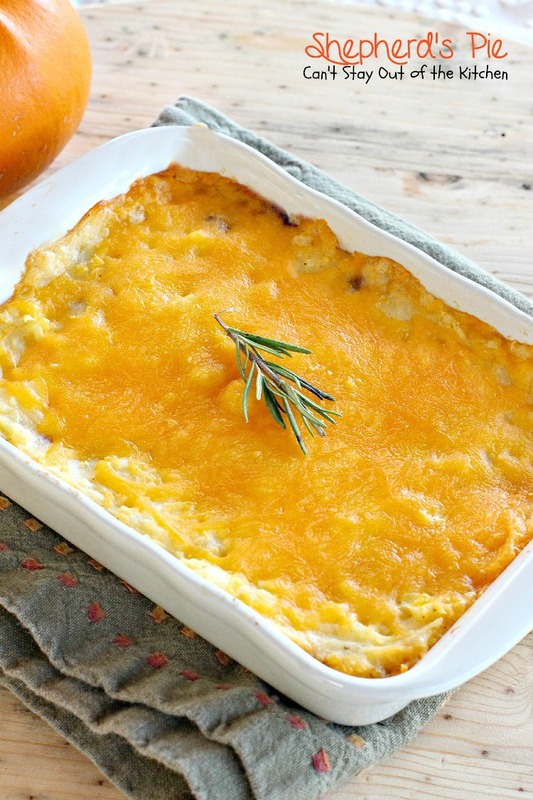 It’s topped with creamy, cheesy mashed potatoes. This version is gluten free. additional fresh thyme for garnish, if desired. 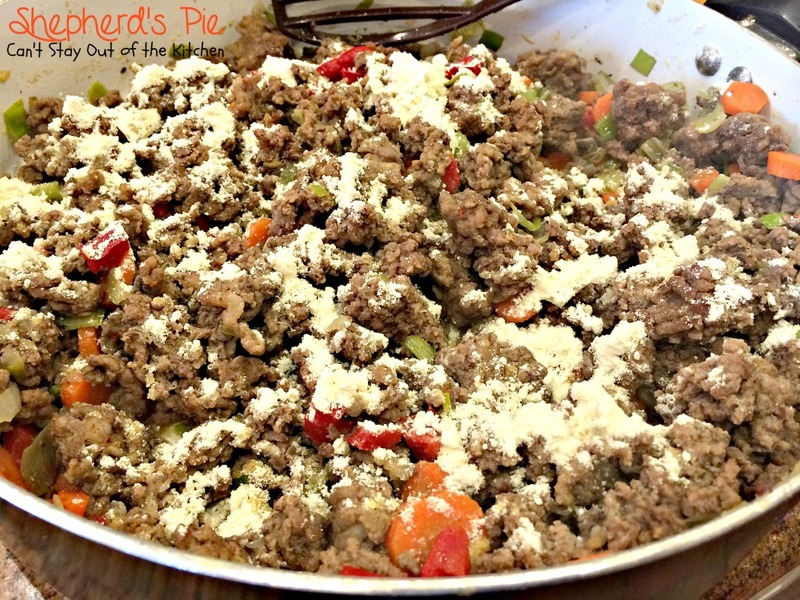 You can also use ground turkey or ground lamb or any combination of meats (beef, sausage, pork, venison, turkey, lamb). Grab a fork and share some with me! 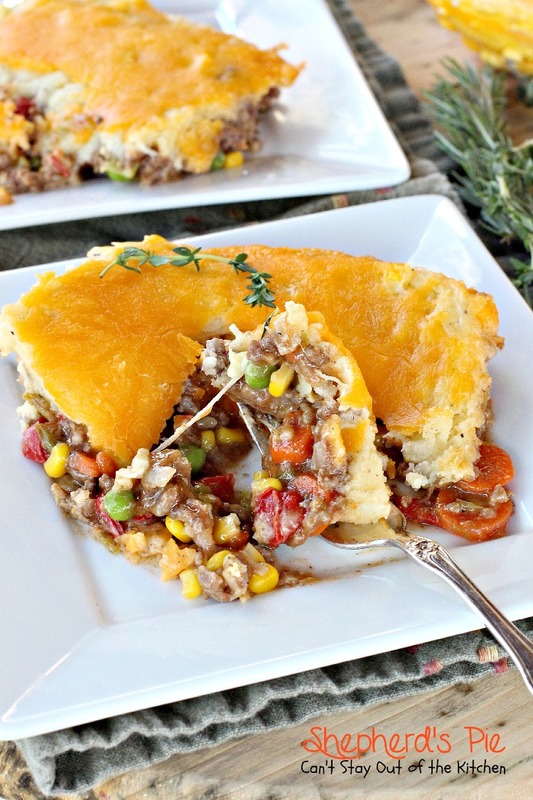 This savory meat pie is one you will want to make over and over again! Shepherd’s Pie is so sensational, you’ll want to put this recipe on your regular menu plans. This sounds like an excellent recipe. I want to make it for my minister and his family (including their seven children), but even with our combined allergies, plus obedience to God’s command not to eat unclean kinds of meat, I can make this almost to the letter. It will be several months yet before I make it for them, but in the meantime, I’m going to make it for me, subbing Italian chicken sausage for the pork, and leaving out all garlic (only two minor changes needed). I make my mashed potatoes with the addition of parsnips–love that taste!–so am going to add them as I always do. Hi, Joyce. 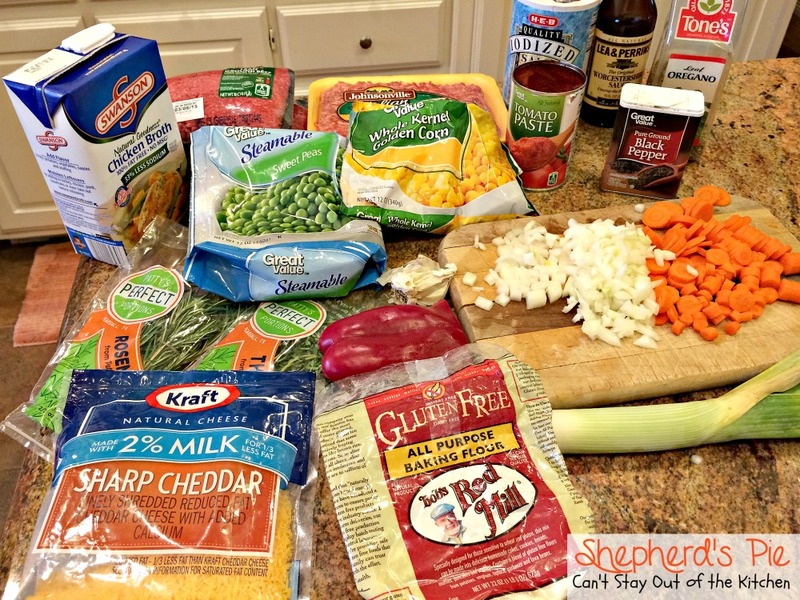 All I can say is this was one of the BEST Shepherd Pie recipes I’ve ever eaten. We absolutely loved it. I hope you and your family enjoy it. Hi! About to try this now and can’t wait! Looks delish! Was wondering, can knowit or sub the butter with anything and when you say 2 egg yolk, does that mean only the yolk or the entirety of the eggs? Haha. Just wanna make sure 😉 thanks! Hi, Anastasia. Only use the yolks. Discard the whites. Hope you enjoy it. I just made the Shepherd’s Pie and it was absolutely FABULOUS!!! I have made my own before, and it is a favourite, but THIS one, with the additions I left out, is SO much better!!! THANK you for posting it, and let me tell you, it is now a standby for my husband and I, and also great for a potluck dish! My husband LOVES it!!! Thank you so much, Lynne for letting me know. I also found this one of the best tasting Shepherd’s Pie I’ve ever eaten. So glad you enjoyed it. You are so welcome Teresa! I wanted to add (as I have seen people do on recipe sites) some small changes I made, only due to personal diet restrictions, but it didn’t change the basic WONDERFUL flavour!! I omitted the leeks, used skim milk instead of half and half, if you can believe that! 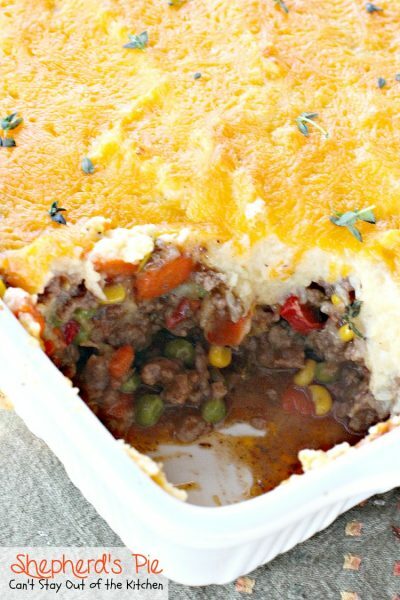 No bell pepper, and used frozen mixed veg with corn and peas and green beans kind..oh I must say again that this is best Shepherd’s pie I have ever tasted!!!!! it has risen above a normal mealtime to a company dish, pot luck I would be proud of, and a fav of my husband! Oh, this looks yummy, Teresa! 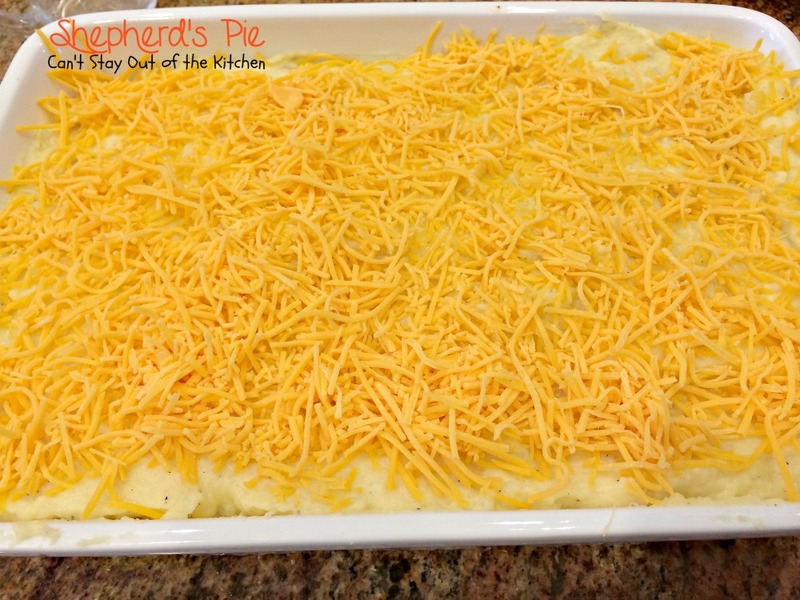 I’ve never eaten Shepherd’s Pie before, but I want to. I love that there is hamburger and sausage, and all the herbs. 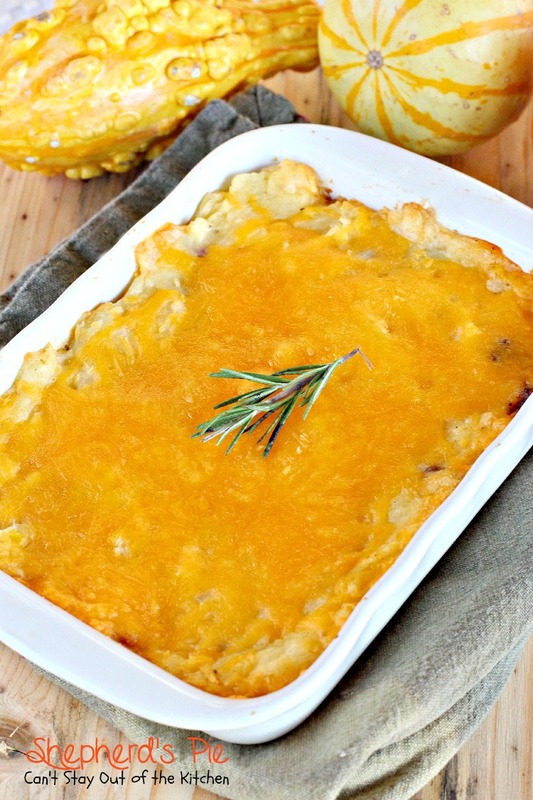 Plus, anything with mashed potatoes and cheese on top has to be good! :) Thanks for sharing your delicious recipe! Shari, I can’t tell you how wonderful this tasted. I loved it. It had a lovely taste, great texture, and a rich, savory flavor that’s second to none! Hope you give it a try.